Carte Reduite Des Costes Occidentales D’Afrique. This large nautical chart of Western African was produced by the French Cartographer Jacques-Nicolas Bellin. Depicts Western Africa from The Canary Islands South through Western Sahara, Senegal, Guinea-Bissau, the Gambia, Guinea, and Sierra Leone. 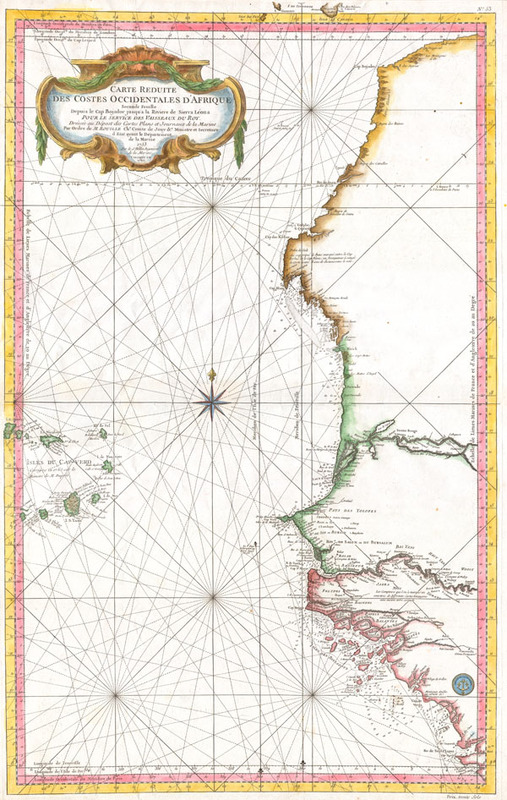 This is primarily a costal chart with depth soundings and navigational marks, but does show the river courses and considerable interior details in the Cape Verde Islands. The remainder of the interior remains largely unmapped. There is a large decorative title cartouche in the upper left as well as a Depot del la Marine stamp in the lower right. All in all, an extraordinary sea chart of Africa's northwest coast.